Are you ready to take your yoga business to the next level or looking for guidance in creating the right business foundation and flow? On April 1, 2016, please join me along with Lynann Politte (manager and promoter of yoga teachers) and 8 other highly experienced yoga experts in a one of a kind online experience designed specifically for yoga teachers who are serious about creating and growing profitable businesses that allow them to increase their reach and teachings in a simple and authentic way. One thing I’ve discovered over the years of teaching, is that the business of being a yoga teacher is just as much a practice and evolution as my yoga practice itself. It is ever-changing, ever-growing, ever-refining, and ever-developing. Taking the time to continually nurture your business the way you do your teachings and practice – is fundamental to finding ease, flow, expansion and success in your own life and what you offer in the world. 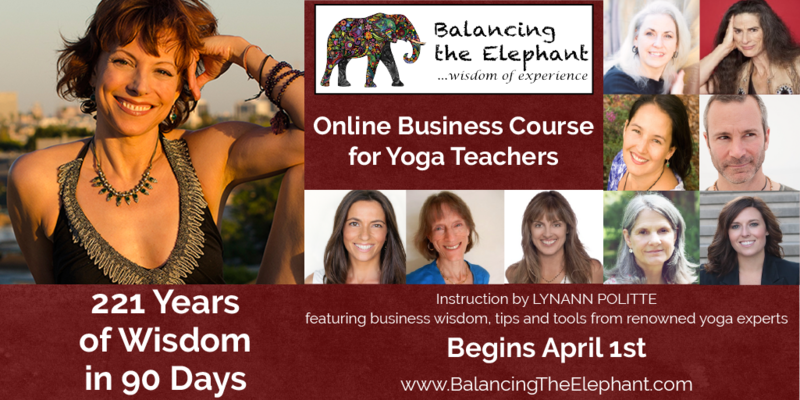 This exclusive online program is called Balancing the Elephant. The program offers the insight and knowledge direct from over 221 years of combined experience teaching yoga and running yoga businesses in the modern world. Over the course of 90 days you will receive wisdom, tips, tools, mentoring, exercises, personalized feedback and more. My own friend and past business coach, Lynann Politte, will personally guide, support and inspire you on your unique path as a yogipreneure from exactly where you are. BONUS: Lynann Polittle will be holding an FREE Q&A call to answer any questions about the program. For full details click here. Want to know if this program is right for you? Email Lynann directly at info@yonispeaks.com. She will be happy to have an honest discussion to make sure this program is the right fit for you by learning where you are in your own in your own yogic career. TAKE THE LEAP & SIGN-UP TODAY!